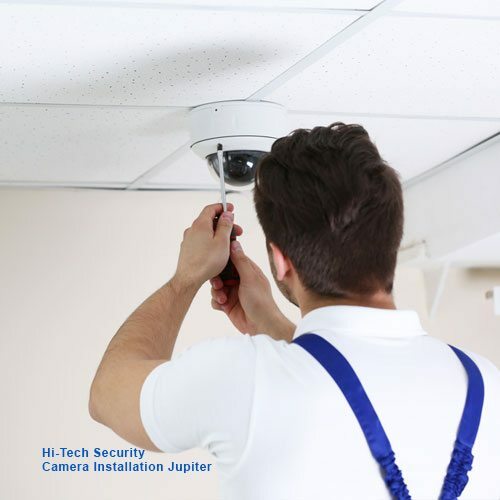 Hi-Tech Security are Certified Security Installers of Sony, Hikvision, Honeywell and Digital Watchdog CCTV and Security Camera Installation service in Jupiter and other cities of South Florida. We specialize in the Custom Installations of HD 1080P Security Camera Systems. We do security camera installations for both Commercial & Residential Customers in other cities of Miami-Dade, Broward and Palm Beach Counties. CCTV Security Camera in security camera Jupiter have become the security standard in accurately protecting both commercial businesses and personal residences. Now, in this day and age if you are attempting to capture video surveillance coverage of actual events that are taking place in your business or personal home, nothing is more accurate than a Security Camera System. This has become a true fact especially for all Commercial Business Owners. A Security Camera System gives you completely unbiast video coverage of all events taking place at a specific location such as employee theft, employee misconduct, customer theft, vandalism, acts of violence and infinite amounts of other activities. Once you have had a system installed, especially at your place of business, you definitely realize that a Security Camera System is an essential necessity and not a luxury!